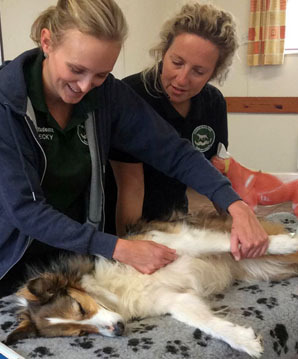 Knowing how to safely stretch your dog can help to improve their flexibility and suppleness which in turn shows as fluid, effortless movement and improved energy as well as helping recovery after exercise and the prevention of injury. Learn How To Stretch Your Dog To Improve Their Mobility & Flexibility! This 1 day workshop will teach you how to correctly and safely stretch your dog and will also dispel some of the common stretching myths that can actually do more than good to your dog. Learn with us and get it right first time, every time! 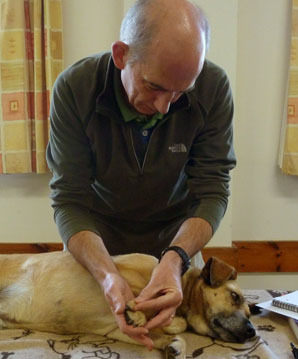 An individual assessment of your dog ROM (Range of Motion) Its important to recognise that all dogs are different so what is a ‘normal’ stretch for one dog may be too difficult for another. We take the panic out of this for you by continually assessing your dogs ROM before, during and after the programme of stretches. Stretching is not a competition and all breeds have their own natural ROM. We show you how. · PASSIVE STRETCHING – Its a fallacy that passive stretching increases injury risk and its also a fallacy that ‘you cant stretch a dog’, you can as long as its done safely. Diploma in Myofascial Release and DORN Method. She is going to show you how its done the way it should be! And a few safety notes…. Please note: Orthopaedic Issues such as Hip Dysplasia, Spondylosis, Arthritis, Luxating Patella etc.. are always taken into account to ensure your dog receives a safe stretching routine. If your dog is deemed unsuitable for some stretches you will be helped to understand why. Your dogs safety and comfort is always paramount. Do we perform MET and PNF on the workshop? No, these methods of stretching rely on the active and conscious participation of the person by holding different types of contractive states eg: isometric and therefore cannot be done with any animal. 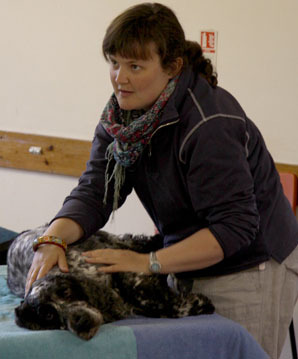 Your tutor for the day is not only a Professional Canine Masseuse but also Human Masseuse who has studied VTCT Level 3 Swedish Massage, VTCT Level 4 Advanced Sports Massage and holds a Diploma in Myofascial Release (Dip MFR), DORN Method, Thai Massage, Sports Taping & Strapping. Natalie brings together all of her knowledge and experience from the human and dog world to ensure your dog gets the best routine possible! This workshop is for all dogs, from agility stars to pet dogs, active dogs to senior ones we look forward to seeing you there! NB: Due to time constraints we only run this workshop once a year so book early! You must provide your own canine companion when attending any workshop! Our workshops in Worcestershire are generally held minutes from Junction 1 M42, Bromsgrove. See shop for details. Should you need to Transfer or Cancel your workshop Booking, admin fees may be applied. See our terms and conditions for details.